Whether or not you have problems with arthritis, you might find your knee “going out” as you walk up a flight of stairs. It happens more often as the body gets a bit older. The study involved 2,300 middle-aged or older adults of varying ages. In the previous three months, 12% said a knee had buckled at least once. Though some had well over half of them had no signs of joint damage at all. Despite the absence of arthritis, knee buckling does pose a bit of a problem. According to the researchers, knee buckling can cause someone to fall and to fracture a bone. One study revealed that 13% of cases of buckled knees had led to a fall. For older adults, a fall on the stairs can easily lead to a major fracture. The second problem is that it causes people to worry about the knee. If they experience a few buckles, they will start avoiding activities that put their knees at risk. This lack of exercise can do far more damage than knee buckling ever could. 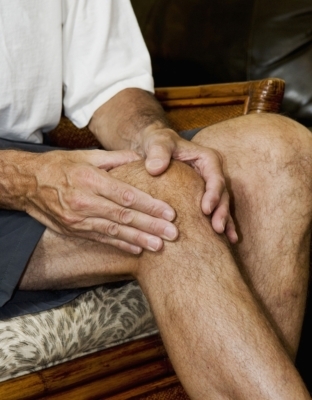 The study indeed found that half the people said knee buckling limited their daily activities. Because pain and arthritis are linked to knee buckling, it’s believed that inflammation in the knee stops the quadriceps muscles from contracting. This destabilizes the joint, and weak quads were found to be a risk factor for knee buckling. The conclusion: strengthen your quad muscles (in the thigh) help prevent knee buckling. Several pieces of equipment at the gym will hone in on this muscle. If you don’t have a gym membership, one easy at-home exercise is the squat. Stand with your feet shoulder-width apart, and bend your knees, keeping your back straight. Then push your body back to an upright position. This works your quad almost individually. Do this slowly and under control and repeat as often as it takes to feel a bit of a burn in the muscle. The study also highlights the fact that people with knee arthritis should watch for any problems with knee buckling and bring them to a doctor’s attention. The last thing anyone wants is a bone fracture.